Unisecure Review 2019: Is Unisecure a Good Hosting? If you need high-availability and high-performance cloud, VPS, or dedicated server solutions that you can customize, then Unisecure is a reputable brand with incredible support. 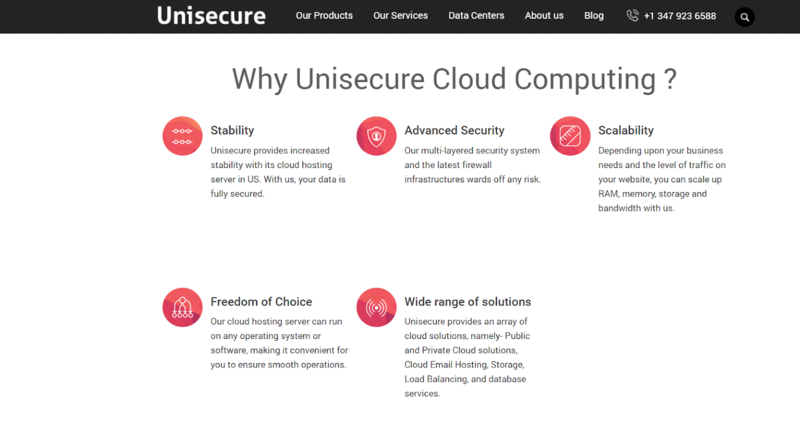 Founded in 1997 and based out of New York, Unisecure specializes in cloud, VPS, and dedicated server solutions tailored to customers’ needs. The company operates two primary Tier IV data centers in Conshohocken and Philadelphia as well as three secondary data centers in Asia. Unisecure serves a customer base of over 50,000 spanning 17 different countries. Unisecure caters to a wide range of clientele, including SMEs, MNCs, government entities, and Fortune 500 companies with their cloud, VPS, and dedicated server solutions. It hasn’t got any basic shared hosting services though. Instead, Unisecure’s more advanced feature set is best suited to those who already have an existing website with a moderate to high amount of traffic. Unisecure’s customers are housed in two state-of-the-art Tier IV data centers. These are carrier-neutral facilities with multiple levels of security, a 24/7 NOC monitoring team, and disaster recovery mechanisms. This is what allows it to provide such a superb uptime guarantee. The company’s other three Asian data centers also provide extra stability and greater speed to market. Unisecure also offers cloud hosting because this delivers enhanced performance, availability, and stability through remote clustered servers. Notably, with the cloud, VPS, and highest-tier dedicated server plans, you get two dedicated IPs instead of just one. Cloud and VPS hosting also come with up to four virtual CPU cores while dedicated servers come with up to two Quad-Core Intel Xeon processors. The provider’s other services include server and rack colocation, load-balanced servers, migration services, and disaster recovery. As Unisecure is a premium hosting provider, it definitely operates at the higher end of the pricing scale. In fact, the company stresses that its solutions are extremely varied and can accommodate a wide range of businesses. For this reason, when signing up, you’ll have to send the sales team a message with more information on your requirements. They will then tailor a suitable product for you. The plans themselves, including billing terms and features included, are quite flexible. However, unlike many other premium hosting services, Unisecure still provides the base pricing for its packages, which makes it easier to estimate your costs. Its cloud hosting definitely starts at an above-average cost; however, I have to say that it’s good value for money considering the dedicated resources and advanced features you get. Pricing for VPS starts out relatively affordable, and dedicated server prices are fairly standard. There are also multiple add-ons that’ll affect your pricing, such as if you need managed services or Windows instead of Linux. Unisecure’s staff are on call 24/7/365 to help customers with technical support queries. 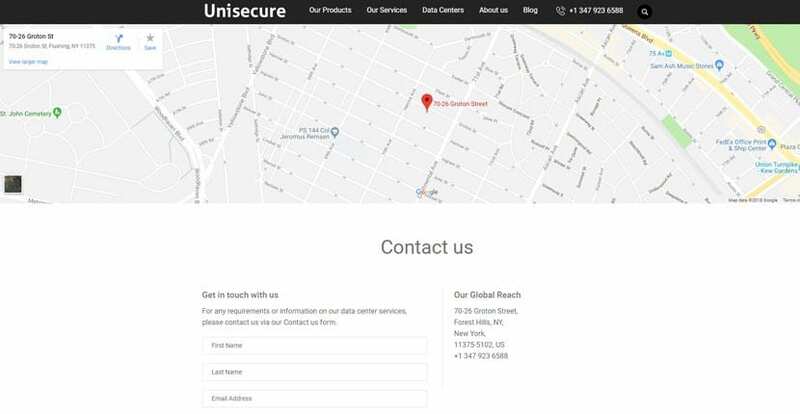 Although you’ll contact support primarily via a ticketing system on Unisecure’s website, you can also reach them by phone if you need a more immediate response. It’s apparent that they prefer either email or phone; the live chat function is just another way to drop them an email. That said, they’ve always responded within a couple hours every time I’ve emailed support. Unisecure doesn’t offer a knowledge base, but with this level of support, you don’t really need it. It almost feels like the 99.995% SLA-backed uptime is enough to justify seriously considering using Unisecure as your host. However, their incredible support and relatively affordable pricing seal the deal. Wondering how Unisecure stacks up against other Web Hosting companies? Enter any other Web Hosting company and we will give you a side-by-side comparison.